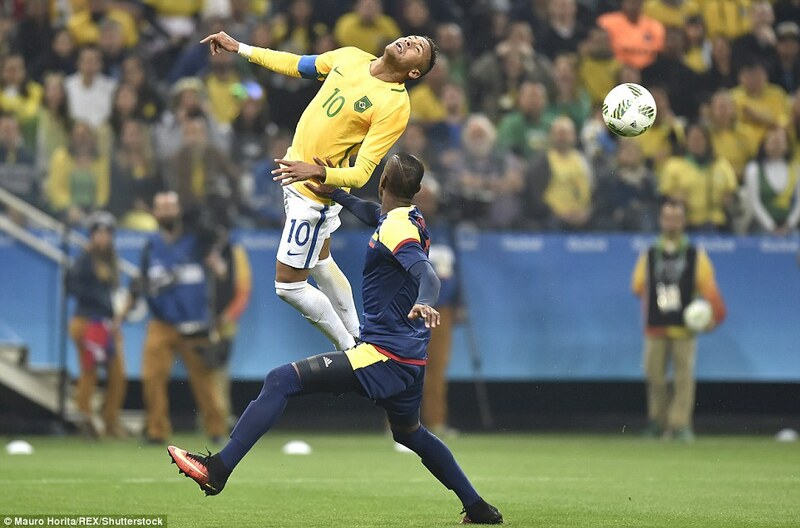 Neymar scored his first goal of the Rio Olympics to give Brazil a 2-0 win over Colombia and a place in the semi-final of the men’s football tournament on Saturday night. 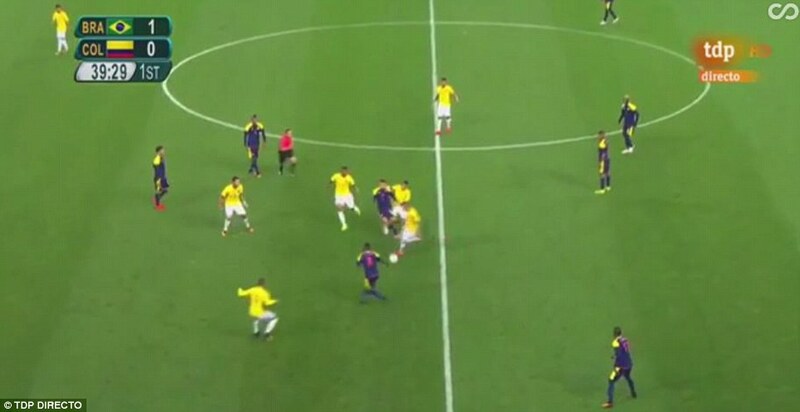 The Barcelona star scored from a free-kick in the 12th minute, sending a right-footed shot through the wall and into the bottom right corner of the net. 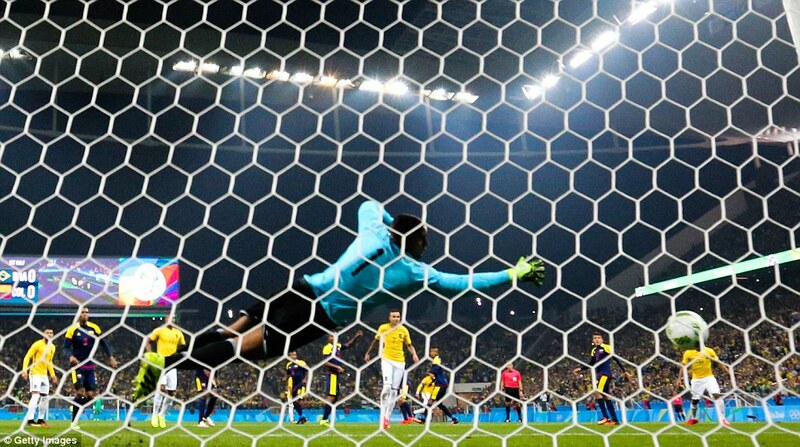 Luan added the second in the 83rd at the Arena Corinthians with a shot from outside the area, keeping alive Brazil’s hopes of winning the gold medal for the first time. 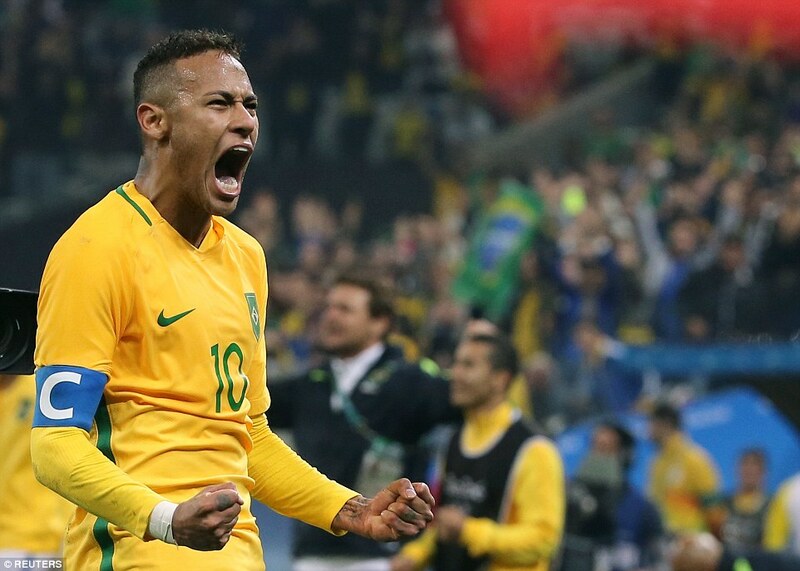 In the semi-final, Brazil will play Honduras, while Nigeria face Germany. Both matches will be played on Wednesday night. 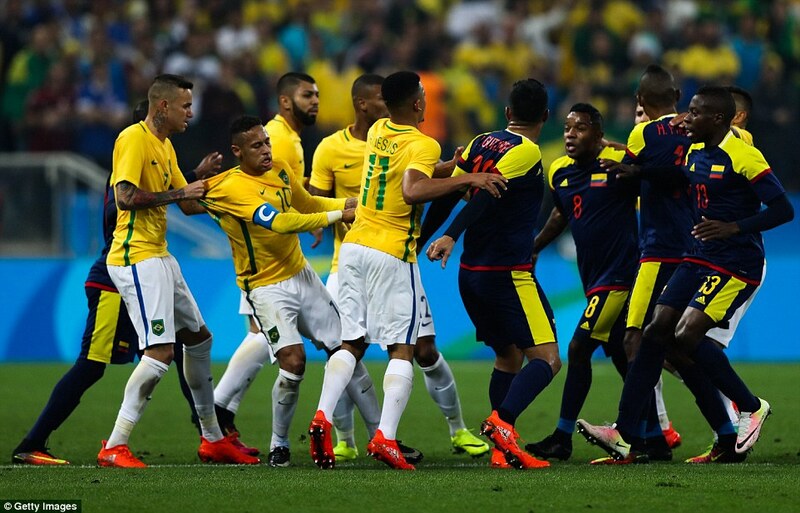 The game, a rematch of the 2014 World Cup quarter-final, was heated from the start, with a series of tough tackles flying in from both teams. 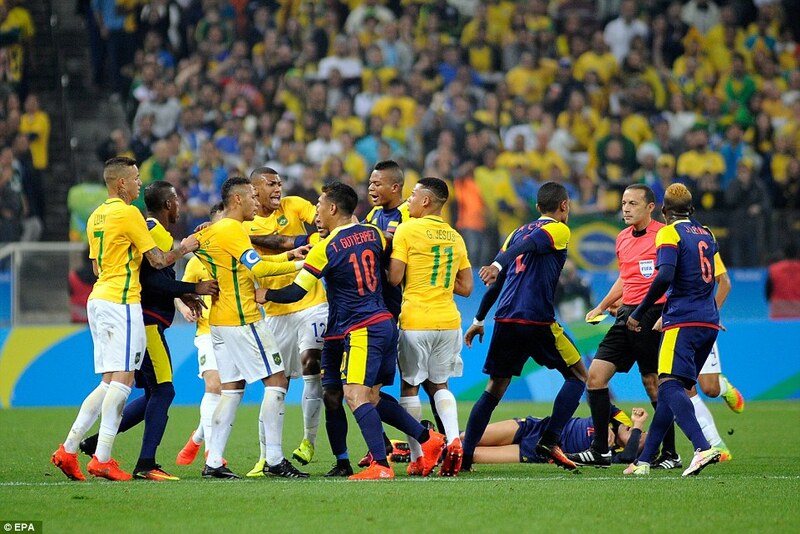 The benches cleared just before half-time after a vicious foul by Neymar, who lashed out after being harassed by opponents nearly every time he touched the ball. 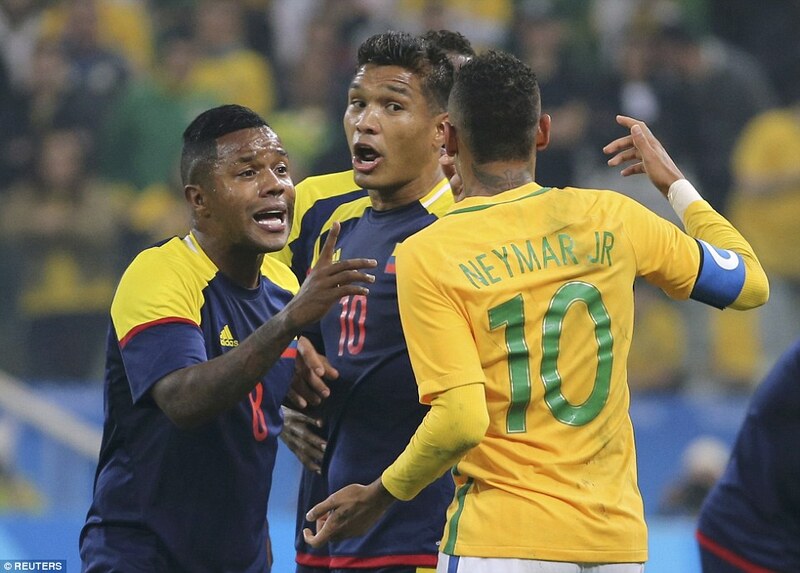 Brazil will face Honduras in the last four, who have reached the Olympic semi-finals for the first time, defeating South Korea 1-0 at the Mineirao Stadium in Belo Horizonte. In the other semi-final match, 1996 Olympic champions Nigeria will face Germany, who are playing at the Olympic tournament for the first time since 1988 – when Jurgen Klinsmann was in the squad. 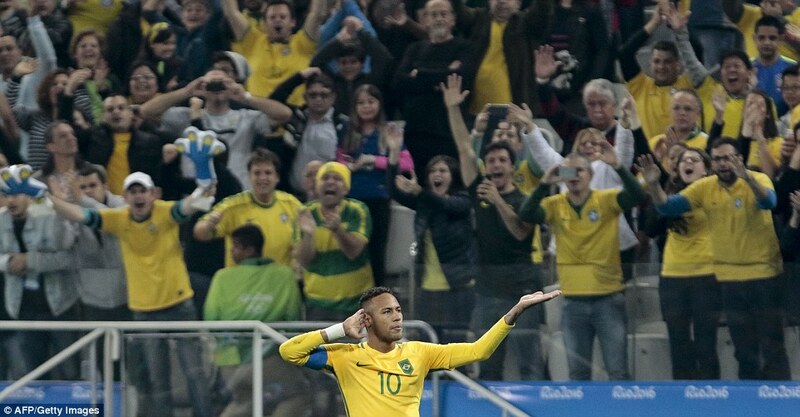 Germany thrashed Portugal 4-0 in Brasilia, while Nigeria beat Denmark 2-0 in Salvador. 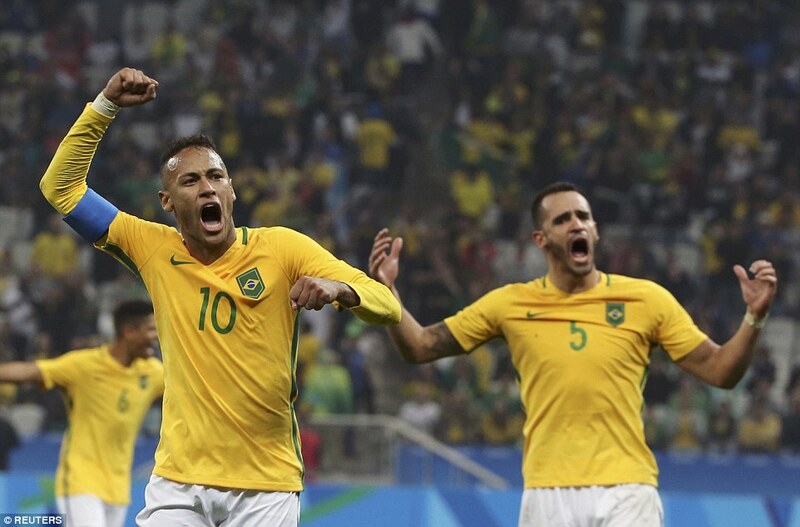 Brazil have never won an Olympic gold medal in men’s football. They lost the 2012 final to Mexico in London. The five-time world champions also finished second at the 1984 Los Angeles and 1988 Seoul Games. The team won the bronze in 1996 and 2008. Can they go one better on home turf? 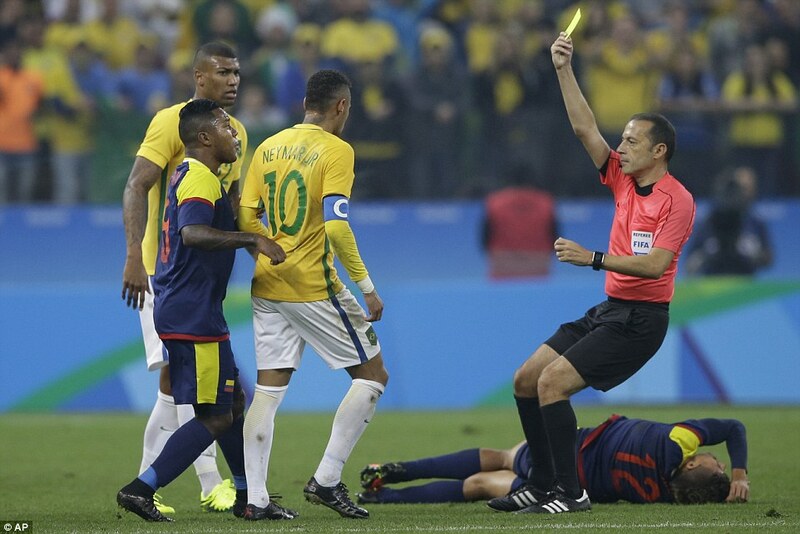 Neymar, one of the biggest stars at the Rio Games, was provoked just like he was the last two times the South American rivals met at senior level, including in last year’s Copa America when Brazil lost 1-0 and the Barcelona striker was sent off. 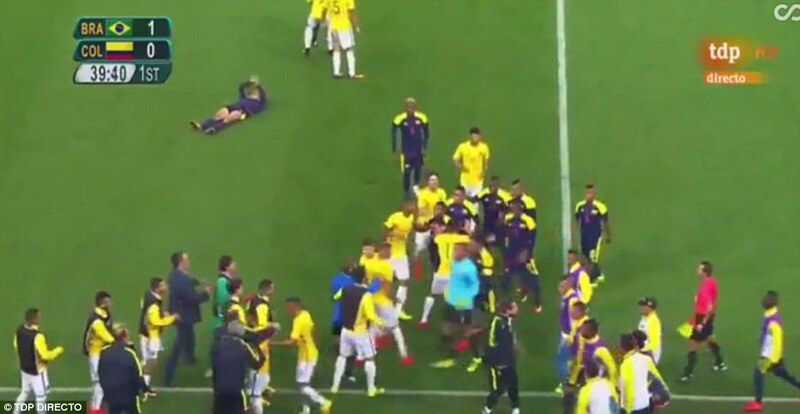 Two years ago, Neymar’s World Cup ended after he took a knee to his back late in Brazil’s 2-1 win over the Colombians. 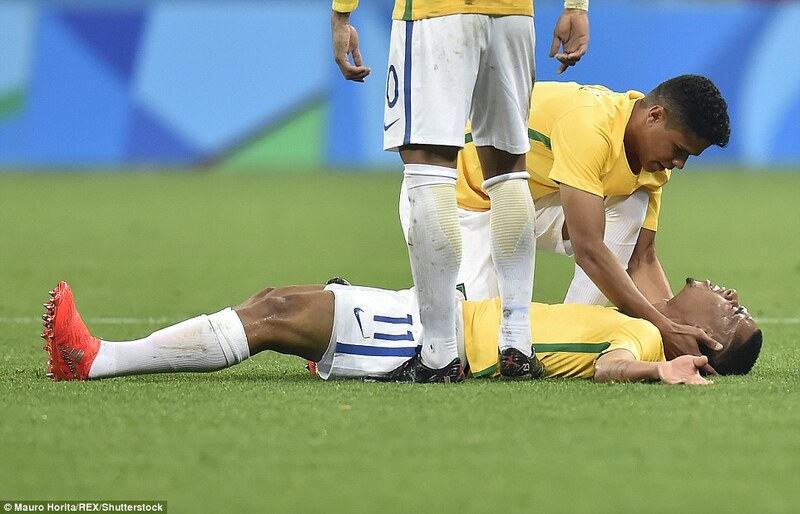 Brazil eventually lost to Germany 7-1 in the semi-finals. 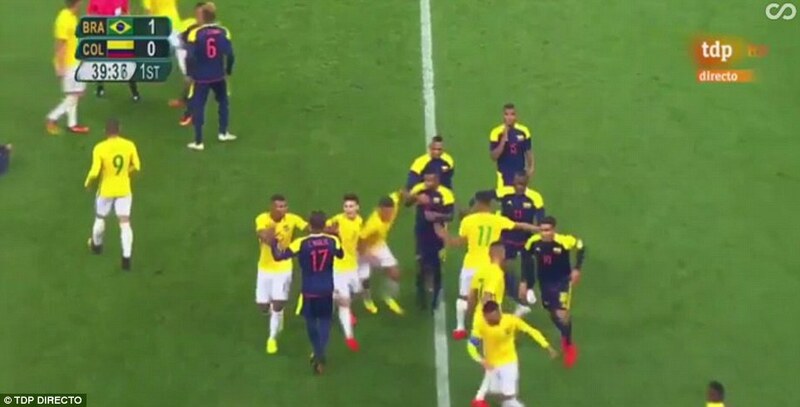 Upset with the way the Colombians were playing against him, Neymar went in hard against forward Andres Roa, a tackle that earned him a yellow card and ignited a brawl involving both benches. 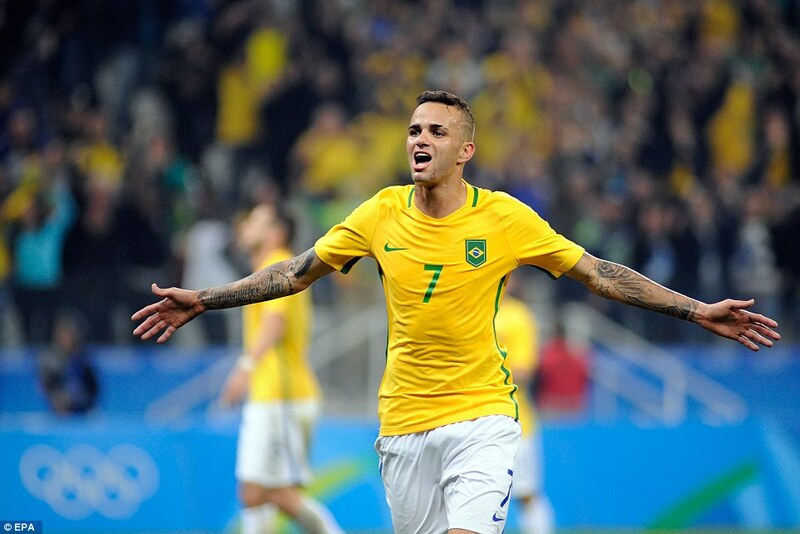 ‘Neymar is experienced and he did well controlling the game,’ Luan said. 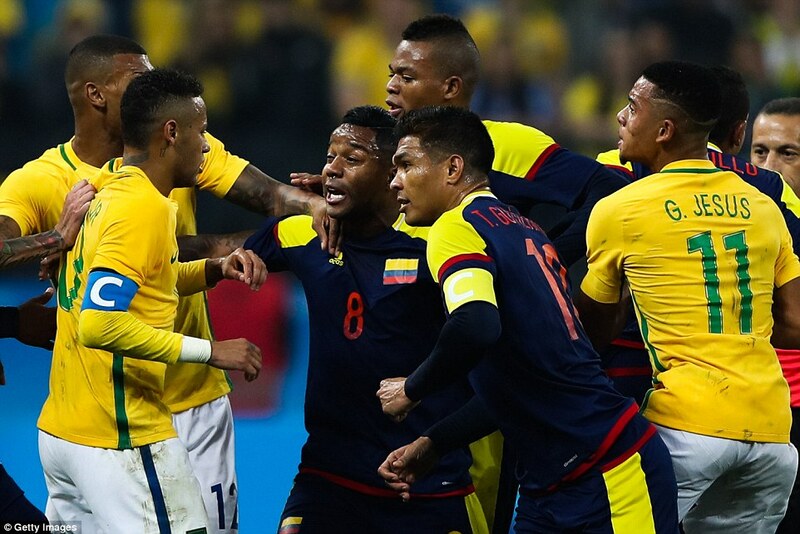 ‘But the whole team deserves credit for being able to keep it together and get the victory. 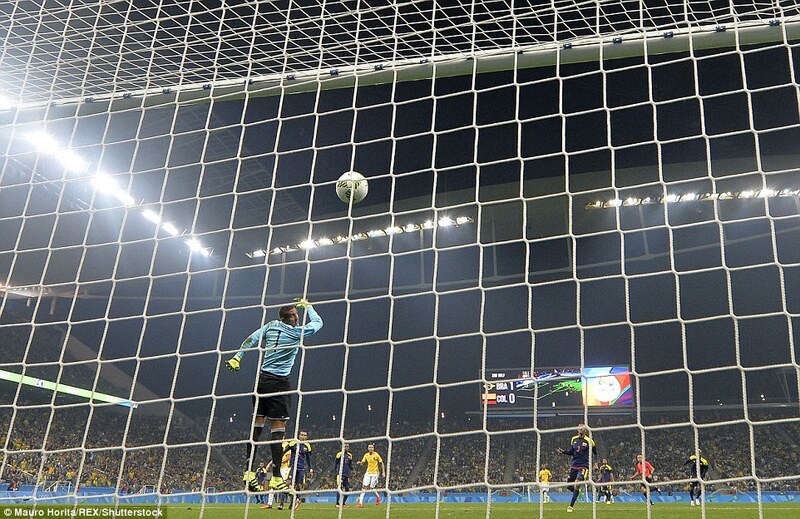 More than 41,000 fans were on hand at the Arena Corinthians, the stadium which opened the World Cup two years ago. 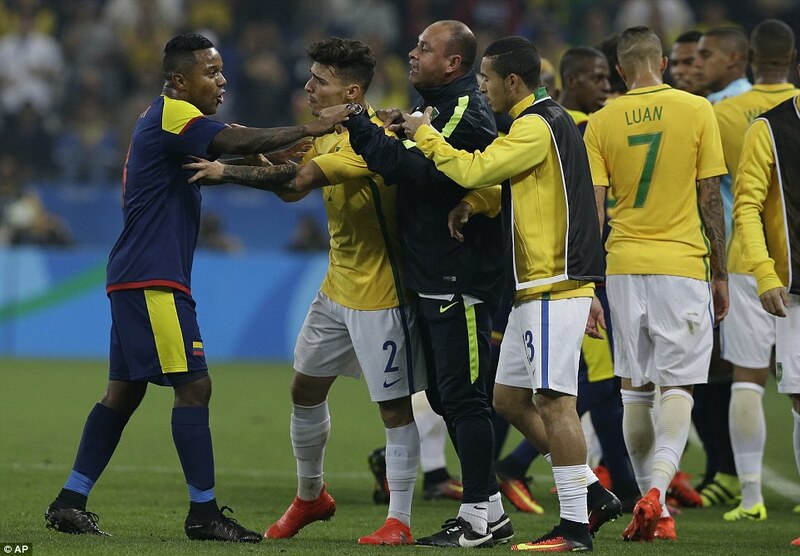 Brazil arrived at the Rio Games heavily favoured to win the Olympic gold, which is the only significant trophy the country hasn’t won in football. 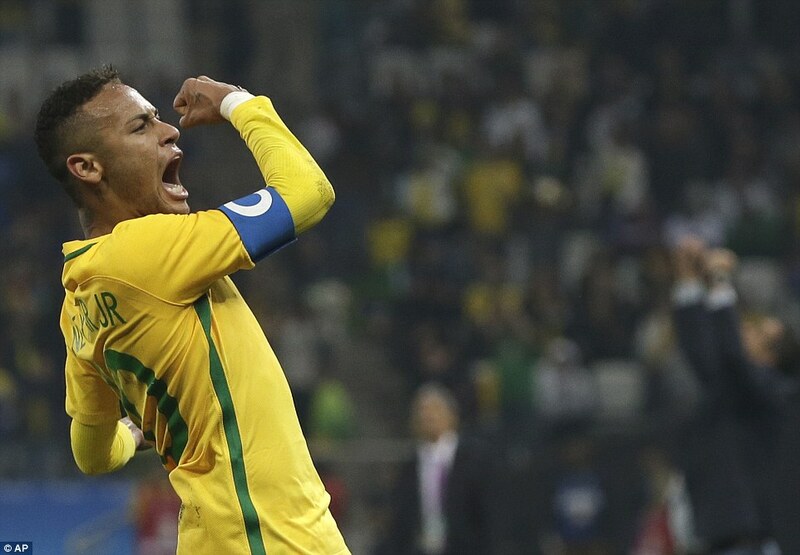 The hosts struggled in scoreless draws against South Africa and Iraq but recovered with a 4-0 win over Denmark to advance to the quarter-finals.